BRIDGEWATER, Va.––Members of Bridgewater UMC expressed appreciation to police officers, fire fighters and the town’s rescue squad on the last Sunday before September 11. “We honored our town’s first responders with ‘Proclamations of Gratitude’ from our congregation, and during our worship services we thanked God for their service,” said the Rev. James M. Tongue, senior pastor. United Methodist Men provided 100 copies of Strength for Service to God and Community for the members of all three organizations, many of whom attended the Sept. 8 worship service in their uniforms. 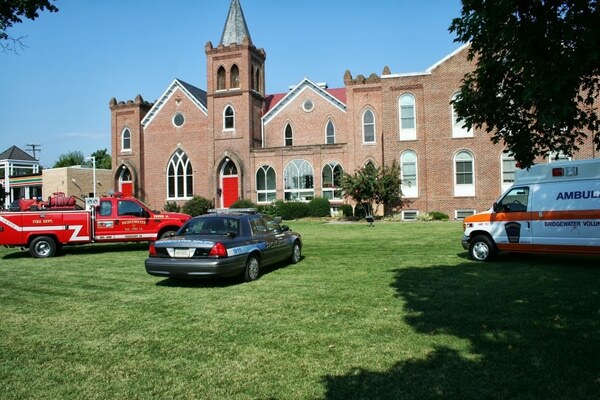 A fire truck, police cruiser and a rescue vehicle were parked on the front lawn of the church, at a busy intersection. During the sermon, Tongue recalled when he officiated at the June, 1995, funeral of Carter Martin, chief usher at Tongue’s church and a professional firefighter in Lynchburg. Martin was assisting motorists stranded on a bridge, when the Timberlake broke and the water level instantly rose more 4 feet, overcoming Martin. “This was the largest funeral service over which I have ever presided,” said Tongue as he recalled how first responders lined the streets on the way to the cemetery. The tragedy paralleled the loss of two Bridgewater first responders in the 1970s when all the schools and businesses closed for the funerals, even the Seven-Eleven.